As I welcomed the new year from my front room, I couldn’t help but feel anxious about the month ahead. The media was going to spend 31 days telling me how fat I am and my mother was going to start questioning my portion size ‘ I thought you said you wanted to cut down?’ For the past 10 years I have made new years resolutions that I didn’t start until January 5th (I needed to cram in all the left over Christmas junk) and I would have given up by the 15th. I remember feeling an overwhelming sense of failure. This year was supposed to be different wasn’t it? 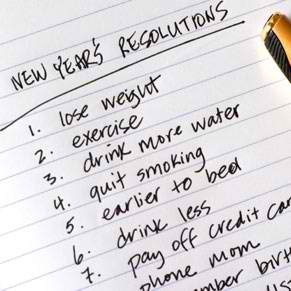 For the first time ever I have given up my new years resolutions. I smoked, drank and overate for most of last year, so I doubt that January was going to be any different. Then the most extraordinary thing happened. I haven’t smoked in two weeks ( yes I stopped in 2014) and I have been to the gym twice in the same week. I have managed to avoid the work cafe and I don’t want to kill anyone because of my chocolate cravings- I don’t have any. I have wanted to adopt a healthy lifestyle for years and it’s finally happening because I’m not overt-thinking it. It’s time to give yourself a break and actually allow yourself to live. It’s natural to want to make changes at the beginning of the new year. However, it’s not ok to mentally beat yourself to a pulp. The nasty things that people say and do to themselves in January is harmful. Like a drink? then why participate in ‘dry January’? It’s only going to make you crave it more. Drinking a glass of wine does not make you an alcoholic, the same as eating a bar of chocolate doesn’t make you fat. Everything in moderation. Despite looking to celebrities for help, look within yourself. No one knows you better then you do. I have an obsessive personality which means I can take the smallest things to the extreme. I knew if I started a diet I would be starving myself by the end of the week. Instead I have decided to cook more regularly which means I have more control of what I am eating. This means I will eat out less. Happy purse and looser jeans! You need to think about what is realistic for you. You might find that January isn’t the time to make any life changes. That’s fine, you are fine as you are. At work they stress the importance of setting time specific goals. It’s the key to getting things done. It doesn’t work that way in real life. Last year I said that I wanted to write 2 blog posts a week. I never did this. The reason is simple- my blogs come to me through life experience. They practically write themselves. I can’t schedule this into a neat time slots. It’s the same with many things. As a self confessed personal development addict, I love nothing better then trying to improve different areas of my life. I am always looking for something better. This means that I spend a lot of time thinking about the future and trying to rush the present. Do you do that? Wishing away the hours, days and minutes so that you can get to that place and achieve that goal? Putting pressure on yourself never gets results. Make this the year that you really live. Don’t be afraid to try new things because you could spend that time working on your goals. If it feels right go with it. I feel like we have all become addicted to self improvement because we are told we are not good enough. Yes you are. Do you know anyone with a 5 year plan? I have encountered those superhumans who have a great plan for their life. I remember a guy at university knew what type of wife he wanted- someone who would look good on his arm during those business meetings. Considering we only graduated 1.5 years ago, I doubt he is in a senior management position. This is an example of how people set themselves up for failure. I was the same for a long time. I had an idea of how my life was supposed to be and it definitely wasn’t this one. Although I love my job it’s not glamorous and I don’t earn enough to live on my own. We can spend so much time trying to create the perfect life that we waste time. I am realizing that the years pass quickly and I want to make the most of them. This means planning exciting/enjoyable things every month. I’m not going to wait for certain things to happen before I start to live. Life is far to short for that. I was inspired to write this blog when I picked up Closer magazine. As much as I complain about the media I love it. The only change is i’m not allowing it to have a negative effect on me and dictate my life. You are the ruler of your own destiny. You have the freedom to make your own decisions. Always remember that.